The North 40 development as proposed was not approved by the town. 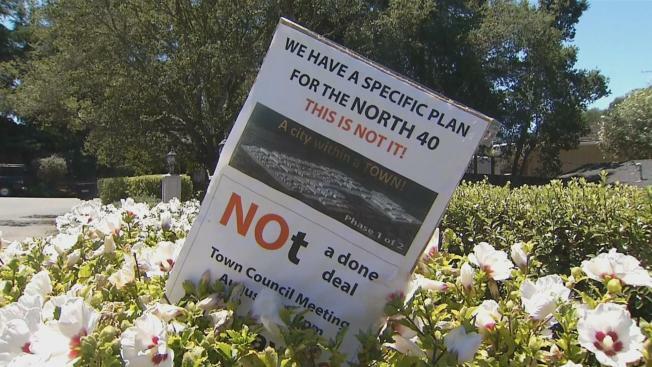 A divided Los Gatos Town Council on Thursday night voted to deny the controversial North 40 development as proposed. The vote was 3-2 against approving the developers' application. Developers want to build hundreds of homes and commerical space on 44 acres between Highway 17 and Los Gatos Boulevard, just south of Highway 85. The proposal calls for tearing out an orchard and building 320 homes and 66,000 square feet of retail stores. Many residents have expressed concerns that the project doesn't fit with the town's general plan. In July, attorneys for the developer sent a letter to the town manager, saying reducing the number of housing units would be inconsistent with the density bonus law and the Housing Accountability Act and threatened to sue if the town denies the planning application.